Boils can be painful and unsightly. They usually occur in areas with hair follicles that tend to get sweaty and are caused by the Staphylococcus aureus bacteria which classifies them as staph infections. Sometimes, the infection will occur where you have been injured, for example, if you have been cut or scraped. Symptoms usually include a red bump which causes swelling and redness around the boil. It starts out the size of a pea and is usually hard but it becomes bigger and eventually will become softer and develop a yellow head. Keeping the area clean and treating it immediately is important as the infection can spread. Sometimes when this happens carbuncles can form. This is a cluster of boils due to the infection spreading to the immediate area around the boil (1). Boils can be caused by a weak immune system, iron deficiency, diabetes, prior staph infections, or poor hygiene. While you can get a boil treated at a doctor, baking soda for boils is effective, affordable, easy to use and you probably already have it in your kitchen. How is Baking Soda Good for Boils? Baking soda draws helps to draw the pus out and dries out the boil. Baking soda kills the Staphylococcus aureus bacteria. 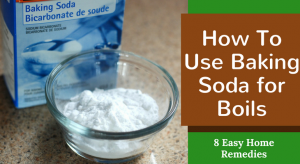 When it comes to using baking soda for boils, there are a couple of ways to do it. You may find that if one remedy doesn’t work that one of the others will. You can also alternate these baking soda remedies with a hot compress or apply a hot compress along with the baking soda. Treat your boil twice or thrice a day for good results. Never scratch or pick at your boils and always wash them before treatment. Add enough water to make a paste. Distilled or filtered water may be best to ensure that no chemicals inflame your boil further. Apply the baking soda paste to your boil. You can leave it on for at least 10 minutes, but using it overnight is very effective. If you are using it overnight use a bandage or a large adhesive bandage with an absorbent center. Rinse it off and gently dry your skin. Oils have their own boil fighting properties. Castor oil reduces inflammation due to its ricinoleic acid content (3, 4). Coconut oil and mustard oil are antimicrobial (5). Olive oil can also be used, but coconut oil was more effective (6). Mix the oil and baking soda at a ratio of 1 teaspoon of baking soda to a tablespoon of oil. Apply the paste to your boils. As with the baking soda and water paste, keep it on for at least 10 minutes, you can also leave it on overnight and use a band-aid or bandage to keep it from rubbing off. Essential oils are also effective at killing bacteria and, in fact, work better than antibiotics since many strains of bacteria are becoming resistant to antibiotics (7, 8). Using them together with baking soda and other antimicrobial carrier oils means that you will have multiple compounds working at treating your boil effectively. Simply create the baking soda and oil paste and add 2-5 drops of essential oil. You can use one or use a combination of oils. Use the same method of application and then rinse the oil off and dry your skin. You can also use the baking soda and water paste if you don’t like using the oil paste. Turmeric is known for its anti-inflammatory properties due to curcumin which gives turmeric its color (9). For this remedy, you will definitely need a bandage or band-aid because it can stain your clothing. Add equal parts of turmeric and baking soda. Mix in some water or oil to make a paste. Apply and rinse it off as you would the above-mentioned remedies. Brew some turmeric tea using a tablespoon of grated or finely chopped turmeric. It should brew for 10-20 minutes. Add enough of the tea to a teaspoon or tablespoon of baking soda depending on how much you want to make. Apply and rinse it as you would the above-mentioned remedies. With method 2 you can add some honey to the leftover tea and drink it to reduce inflammation in your body and relieve the pain. This is a much healthier way of reducing pain since other NSAIDs can damage your stomach lining. Epsom salt also helps to drain the boil and dry it out. Dissolve a tablespoon of Epsom salt per cup or so of water. It works best with warm water. Add a bit of the Epsom salt solution to a teaspoon or so of baking soda to make a paste. Apply and rinse it as you would the other methods. Prepare the Epsom salt as you would above with warm water. Add a tablespoon of baking soda and mix it well. Soak a cloth in the mixture and apply it as a hot compress to the boil. Leave the hot compress there until it cools. You can dip the cloth and reapply it again if you’d like. Do this for up to 20 minutes. Note: You can add 2-5 drops of essential oil to the paste and 5-10 drops for the hot compress if you want to. Apple cider vinegar is antimicrobial, anti-inflammatory, and also has an alkalizing effect. If this remedy irritates your skin, you can dilute the apple cider vinegar in some water first. A dilution of 2 tablespoons per glass of water will work. Mix together equal parts of baking soda and apple cider vinegar (or the apple cider vinegar and water solution). Apply this paste to your boil for 5-15 minutes. Rinse it off and dry your skin gently. Wash your hands before and after treating your boil as the bacteria can spread. Don’t use the same towel or cloth that you use to treat your boil on other parts of your body as a precaution. Don’t share towels or clothing with others. Some people may find that baking soda is too drying. Use the baking soda and oil remedy if this is the case. A hot compress can be applied every few hours to ease the pain and help the baking soda remedies along. Always do a patch test before using any remedies to treat the boil. Essential oils should be diluted before applying to your skin. 2-5 drops of essential oil per tablespoon of carrier oil (e.g. coconut oil or mustard oil). Speak to your doctor before using essential oils if you are on any medication, have a medical condition, are pregnant or breastfeeding. They can interact with different medications and hormones. If your boil doesn’t improve within a few days or gets worse it’s best to see the doctor, especially if you develop a fever. If you find that baking soda isn’t for you, try one of these other effective home remedies for boils. Please let us know if baking soda has worked for you and share any other tips that you have for treating boils.